Healthcare facilities exist to improve the lives of their patients, and the interior design should convey this. Traditionally, healthcare facilities have attempted to make their interiors more appealing by doing simple things like installing pastel art on the walls. They can do better. According to an article from The Atlantic, titled ‘better aesthetics in hospitals can make for happier—and healthier—patients’, there is evidence that interior design can be part of the healing process stating that “mounting clinical evidence suggests that better design can improve patients’ health” and that aesthetically pleasing design also serves to improve the morale of patients. 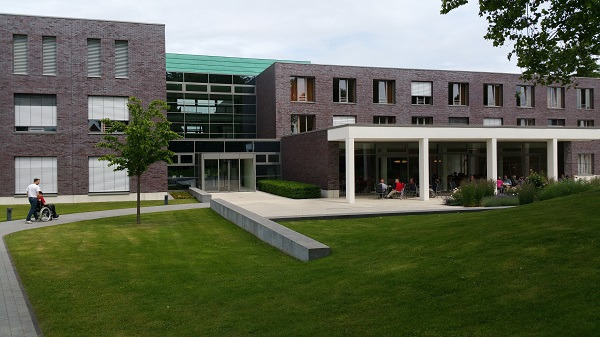 Imagine this, you’re walking into a medical building that has a nice, aesthetically pleasing exterior. You’re pushing your grandma in a wheelchair or walking your child inside and once through the doors the walls are all off-white and dotted with random paintings of flowers and fruit. It’s cold inside and an incandescent light flickers slightly in the distance. This is the experience millions of Americans have every year. The following is a list of 10 interior design ideas for healthcare facilities. Go bold. The interior atmosphere is your first impression upon entering a healthcare facility. Seeing bold aesthetics will immediately make you feel that this place is different from other medical offices or hospitals. Stark designs can elevate the overall feel of a room while helping to reduce any anxiety associated with going to a hospital or medical facility. Cramming too many design types in a room can create a “busy” look and make the room feel smaller and more cluttered. Modern, contemporary, rustic, colorful, and dull don’t mix well. Pick one. Healthcare facilities aim to create an atmosphere of serenity. Busy designs often do the exact opposite and create confusion and stress. It is not recommended that you include multiple design types in one room; however, you can experiment with different types of designs in different rooms. 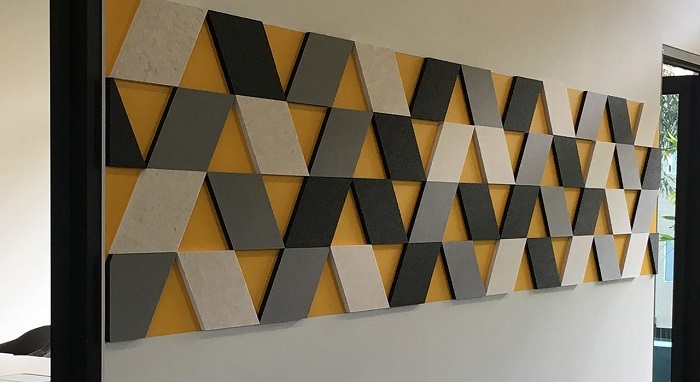 Two clear examples of this would be geometric acoustic tiles in an adult exam room and a cartoon mural in a room or section of a facility just for children. Knowing when to use color can make a big difference. Specifically, using bright colors in a children’s hospital is a fantastic idea. The goal of interior design in a healthcare facility should be to make the patient and visitor feel welcome. A children’s hospital should have a childlike atmosphere. This includes using vibrant colors. How many hospital waiting areas look like the inside of a DMV? Cold, hard chairs and a lack of interior design fixtures are a staple of DMVs around the country. 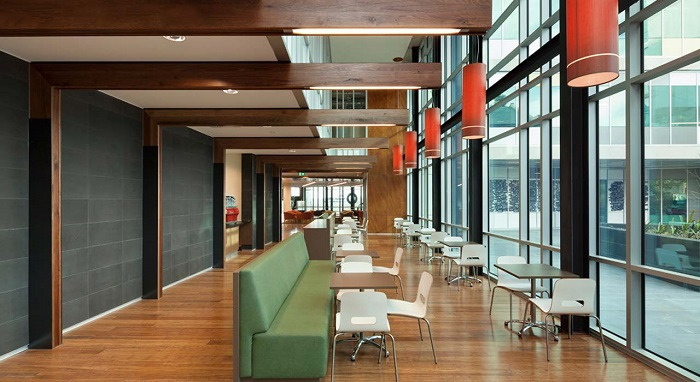 Let’s make the waiting areas of our healthcare facilities look different and feel more inviting. Color should be added to furnishings and decor in the waiting room, seating should be comfortable yet easy to clean, and the walls should be nice to look at while being modern and helping cut down on noise. Healthcare facilities are concerned with the mobility of their patients and furniture should be designed to accommodate this. For example, hospitals must include wheelchair accessibility into their floor plans. Couches, tables, and chairs can be placed in a way which allows people with limited mobility to enjoy the design of the room the same as others would. Trees, plants, flowers—these living organisms can elevate the atmosphere of any indoor room. Having these in the entrance of a healthcare facility will allow for a seamless transition from the outdoors to the indoors. It doesn’t have to stop at the entrance. 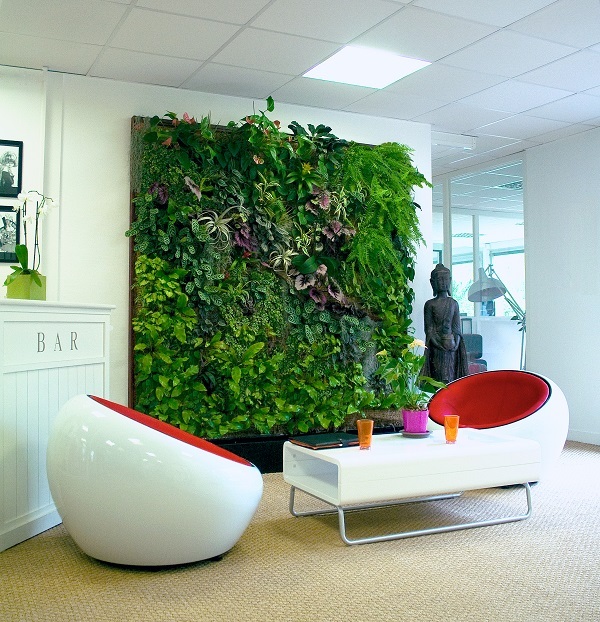 You can place these elements of nature throughout the facility. There are private spaces in hospitals and other types of healthcare facilities. These are the rooms where families have important conversations and make potentially life-changing decisions. If any room in the facility should be toned down with interior design it’s here. By using a strategy to minimize loud types of design, the family can focus on their conversation. Most of the points so far have focused on the patient and visitor. This one, however, pertains to employees and other people working in the facility. It’s possible to create an environment which is conducive to productivity. Softline Floor Screens or other semi-partitions can increase productivity and concentration. At the same time, these fixtures can retain the open atmosphere of the office. Finally, and arguably the most important point, know your fabrics. Before you can plan a remodel or original design you have to know what’s available. Upholstery, vertical surfaces, drapery, wall—these are what the fabrics can be applied to. When choosing a fabric you need to take a few factors into consideration to include: washability, flammability, and weight. We offer fabrics designed specifically for healthcare facilities. Browsing our designs can give you an idea of how you’d like to plan the interior design of your facility. In addition, our acoustic products such as our Ecoustic Arbor and Triline Wall can be strategically placed to improve any room’s atmosphere. When you contact us, one of our representatives will help bring your ideas to life. Planning the interior design for a large facility can be a daunting task; however, having another expert on hand creates a synergy that makes the process easier. Give us a call today to get started and you’ll be one step closer to meeting your design goals.